As a symbol, he raises several remarkable possibilities. Is America now the kind of society that can allow a black -- of whatever pedigree -- to become the most powerful human being on earth, the commander of the greatest military in history? Have our democratic principles at last moved us beyond even the tribalism of race? And will the black American identity, still so reflexively focused on victimization, be nullified if a black wins the presidency of this largely white nation? Enumerating the cultural and political constraints that keep Obama  and the nation  bound over race, Steele's answer is a qualified no. Steele has brilliantly dissected the intellectual perversities that present blacks as dependent victims, reduced to trading on their moral blackmail of whites who are eager to be blackmailed in exchange for absolution. But Steele radically misreads Obama, missing his emancipation from those perversities. Obama seems to understand America's race fatigue, the unbearable boredom occasioned by today's stale politics generally and by the perfunctory theatrics of race especially. Is America really ready to see beyond race? Read more from Shelby Steele below and talk back on the blog. Shelby Steele is the Robert J. and Marion E. Oster Fellow at the Hoover Institution. He specializes in the study of race relations, multiculturalism, and affirmative action. He was appointed a Hoover fellow in 1994. Steele has written widely on race in American society and the consequences of contemporary social programs on race relations. In 2006, Steele received the Bradley Prize for his contributions to the study of race in America. In 2004, he was awarded the National Humanities Medal. In 1991, his work on the documentary SEVEN DAYS IN BENSONHURST was recognized with an Emmy Award and two awards for television documentary writing-the Writer's Guild Award and the San Francisco Film Festival Award. Steele received the National Book Critic's Circle Award in 1990 in the general nonfiction category for his book THE CONTENT OF OUR CHARACTER: A NEW VISION OF RACE IN AMERICA. Steele is also author of WHITE GUILT: HOW BLACKS AND WHITES TOGETHER DESTROYED THE PROMISE OF THE CIVIL RIGHTS ERA and A DREAM DEFERRED: THE SECOND BETRAYAL OF BLACK FREEDOM IN AMERICA, in which he argues that too much of what has been done since the Great Society in the name of black rights has far more to do with the moral redemption or self-satisfaction of whites than with any real improvement in the lives of blacks. Bill Moyers talks with Kathleen Hall Jamieson about how the Internet has transformed the political discourse  and how gender is playing out the campaign. With the noose and the lynching tree entering the national discussion in the wake of recent news events, Bill Moyers interviews theologian James Cone about how these powerful images relate to the symbol of the cross and how they signify both tragedy and triumph. Princeton's Melissa Harris-Lacewell on the trouble America has talking about race. "There is the unspoken hope that his mixed-race freshness carries a broader political originality. And, in fact, he does embody something that no other presidential candidate possibly can: the idealism that race is but a negligible human difference." George F. Will's rebuttal of the central arguments of Steele's BOUND MAN. "Steele has brilliantly dissected the intellectual perversities that present blacks as dependent victims, reduced to trading on their moral blackmail of whites who are eager to be blackmailed in exchange for absolution. But Steele radically misreads Obama, missing his emancipation from those perversities. Obama seems to understand America's race fatigue, the unbearable boredom occasioned by today's stale politics generally and by the perfunctory theatrics of race especially." 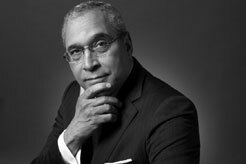 Shelby Steele is the Robert J. and Marion E. Oster Senior Fellow at the Hoover Institution. He specializes in the study of race relations, multiculturalism, and affirmative action. You can read an archive of his columns at the site, including the recent entries "Obama is Right on Iran," and "The Legacy of Little Rock." Steele's analysis argues that after World War II, "the West was left stigmatized by its sins. Today, the white West--like Germany after the Nazi defeat--lives in a kind of secular penitence in which the slightest echo of past sins brings down withering condemnation. There is now a cloud over white skin where there once was unquestioned authority." And that cloud changes the way America fights wars. "Two great, immutable forces have driven America's attitudes, customs, and public policies around race. The first has been white racism, and the second has been white guilt." Read excerpts of the book online. >Read more about the "Oprah Factor"
What now? Our campaign expert looks behind the post-New Hampshire headlines. 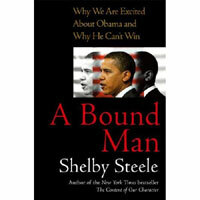 Bill Moyers talks with Shelby Steele, who has written widely on race in American society and is author of the recent book A BOUND MAN: WHY WE ARE EXCITED ABOUT OBAMA AND WHY HE CAN'T WIN. Fourteen questions you need to ask before trusting the numbers, the history of polling and an interview with the founding father of public opinion research, Daniel Yankelovich, from the MOYERS DIGITAL ARCHIVE.